It is with great sadness that I write to you with news that one of our most devoted, loved and long standing students, Gillian Ballance, passed away at the end of January. Gillian was 89 years old and, despite many challenges to her health, continued to attended three Insight classes each week. 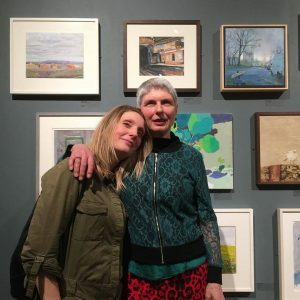 Gillian’s ambition was to have a painting selected for the Mall Galleries in London, so it was with joy and sadness that just after her death, we received news that a painting of hers had been accepted for this years prestigious Lynn Painter Stainer Prize at the Mall Galleries, opening on March 5th 2019. Gillian led a fascinating life. In 2013, to accompany her exhibition at Insight School of Art, Paul Regan interviewed her in front of a packed audience, and ask questions about her paintings and the stories behind them. A film of the interview is still online and can be watched here. The following text supported the film in 2013. It’s reminds us of what a special person Gillian was and how she has influenced the lives of so many people. After retiring in the 1990s, Gillian travelled to Mostar, Bosnia to help people traumatised by war. This was followed by returning to London to support asylum seekers affected by torture and most recently, up to the present day, working to support trafficked women. Gillian describes painting as her ‘art therapy’ and her work, although until recently quite unintentional, clearly reflects the traumas she has witnessed. Whether working in oils, watercolour or drawing, Gillian’s work always shows a technical struggle with the medium. She applies layers of thick paint until she finds her subject, often passing through numerous incarnations and consistently changing compositions. She often revisits work months after announcing that a work is finished. Gillian’s exhibition in September 2013, which accompanied this talk included landscape and figure work, but the highlights were possibly the three large monochrome oils on canvas depicting Michelangelo’s unfinished sculptures of prisoners; images of which Gillian has lived with since childhood, but only recently choosing to paint, in her own words; ‘the struggle of figures emerging from the stone’. Here is Gillian’s Niece and Great Niece admiring Gillians paiting at the Lynn Painter Stainer Prize Private View.